The Authority is probably the closet thing you can get to a truly modern day, or contemporary type super heroes. In fact, any writer that has written stories for the Authority franchise, is forced to elaborate and experiment with the characters in the book. It’s a way the characters have developed or evolved. Unorthodox type heroes, in unorthodox situations. The Authority as a concept is a post modern, revolutionary type idealism mixed with a casual cynicism for the human race, but nevertheless trying to protect humanity from various foes and enemies. The Authority team just has so much personality and good writers are able to reflect that personality from each of character’s in the story telling. Because each character has a quirk, a characteristic that makes them unique and as I said contemporary. Which is essential, if the reader is to relate to stories and character interaction in the book. Jack Hawksmoor is at times the default leader of The Authority, and if anyone has followed the Authority and their stories. You would know that the Authority reside on a huge spaceship (The Carrier) that travels in the bleed of space, the Authority operations are staged from the Carrier using portal doors. Jack Hawskmoor in a lot of ways have not really been a stand out character of late. The recent Midnighter series, which I might add has been excellent, has taken the Authority’s residential homosexual and killer of bad guys into new ground. There is a steady development of the Midnighter, in which writer Keith Giffen is crafting and adding a lot more depth and interest into the Midnighter character. Please refer to ‘Overview on Spotlight ‘Midnighter’ #11 and #12 (writer Keith Giffen)‘ for review. So finally we get see the Authority’s Jack Hawskmoor get his own comic book series, written by Mike Costa and art by Fiona Staples. Issue #1 starts of with the Authority trying to take down some ancient manifested Slavic God inside the city of Kiev, but something occurs in the time line and we see Jack Hawskmoor back in 1994, in San Fransisco before he joined the Authority; and apparently unaware to him any events that occurred in the future, or did they occur? I think Jack Hawskmoor could be portrayed as that inner urban modern day super hero I mean the way he dresses, Georgio Armani pants no shoes, bare feet (with surgically enhanced soles – built in traction), Ermenegildo Zegna shirt and jacket. I alright I am guessing what brands he wears, but he has that dress/casual look going. No tie though. Point is, with the powers he has, which he is able to command cities, hence the pseudonym God of Cities. 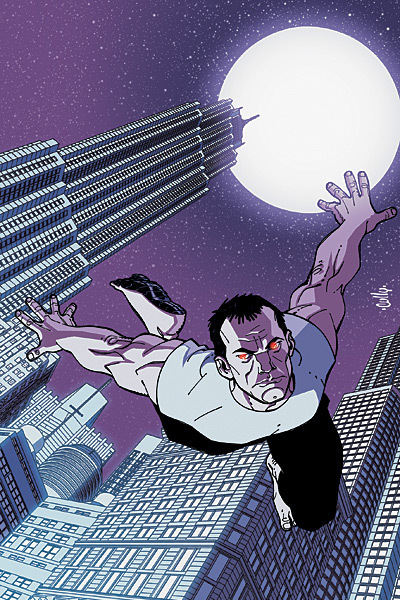 Unable to draw power outside from a city, his powers are magnified within a city. The pollution, the concrete, metal construction all represent a power source to the character. So it’s a cool concept, especially with the 1st issue showing a gigantic robot out of control in San Fransisco bay, trying to tear down the Golden Gate Bridge. For the first time in a series independent from the Authority, we get to see why Jack Hawskmoor is called the God of Cities. Commanding old (earth quake of 1906, at the bottom of the bay) San Fransisco city to hold the feet of the maniacal robot. The art for The Secret History of the Authority – Jack Hawksmoor is handled extremely well, good fluid and expressive art. Drawn by Fiona Staples, she has shown a unique style and perspective on the Authority and the characters. But god is in the details and Staples is doing an excellent job. Keep an eye out for her work. I remember the Daredevil DVD and it had some commentary and extra footage of the characters and writers of DD. Kevin Smith who wrote Daredevil at some point, mentioned that Daredevil is the ‘Grateful Dead’ of comics. I am not too sure what he means by that, but he is saying that Daredevil represents the cool or underground style comics from a major comic company (Marvel), maybe. But as an urban, or underground type characters with a loyal core following, DD is a depressive comic, dragged down by writers that can’t seem to pull the character out of the hole he has been written into. You gotta love the beginning of a story when it’s ‘the strange girl, but strangely familiar’ scenario and ‘her perfume’ theme (and this is said twice at the start and the end of issue #1), how can you go wrong with that? This entry was posted on March 31, 2008 at 11:54 pm	and is filed under Books, Comic Reviews. You can follow any responses to this entry through the RSS 2.0 feed. You can leave a response, or trackback from your own site.